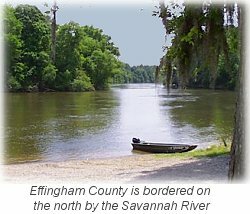 Located in southeast Georgia, just south of the South Carolina border and 20 miles northwest of the historic city of Savannah, Effingham County is one of the fastest growing communities in the State of Georgia. It consists of the incorporated cities of Springfield, Rincon and Guyton, along with a number of hamlets such as Blandford, Clyo, Ebenezer, Eden, Egypt, Faulkville, Hodgeville, Marlow, Meldrim, Pineora, Shawnee and Stillwell. This website gives you the opportunity to learn a lot about Effingham County. Whether you are a current resident, former resident or someone who is thinking about moving to this area, there is a lot of information here that you will find interesting. You can be a part of this website. You can have your name added to our E-mail Directory at no charge. Businesses that want to promote their products or services can do so by purchasing a banner ad or a listing in our Effingham County Business Directory. If it's fun that you are looking for, then click on the link to our Goodies section. There you can find a lot of fun links to sites that the whole family can enjoy. 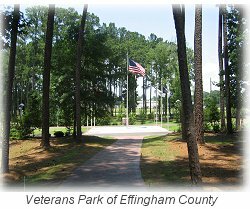 Just like Effingham County, "Effingham Today" is always changing. So make a point of coming back often. Savannah Website design, hosting and maintenance by InterWeb Designs, Inc. Copyright � 1996-2010 by InterWeb Designs, Inc. All rights reserved.